these are all a mix of ventricular tachycardia and SVT with aberrancy. This 51 yo male complained of chest pain, then had a v fib arrest. He was resuscitated and brought to the ED where this ECG was recorded. He was in cardiogenic shock. There is tachycardia, and there is a wide complex. This wide complex tachycardia could easily be misdiagnosed as V tach. However, there are p-waves, and this is a classic RBBB + LAFB (left anterior fascicular block) morphology. When V tach originates in the left ventricle, there may be an RBBB-like complex, but because VT originates in the myocardium, not in the left bundle (as does RBBB), it does not look exactly like RBBB, as this one does. The left anterior fascicular block can be diagnosed by the left axis deviation. RBBB alone would have S-waves in I and aVL; since there are late large R-waves, there is LAFB. So now we can say it is sinus tach with RBBB + LAFB. Is there ST elevation? One must find the end of the QRS in order to determine this. I have done this and marked it up in the image below. The end of the QRS is easy to find in V1. One can then draw a line down to the rhythm strip at the bottom, which is lead II. Thus, you can find where in lead II is the end of the QRS. Then you can go to all parts of the ECG to find the end of the QRS. As you will see, this results in the discovery of ST elevevation in V2-V4 and I and aVL, diagnostic of anterolateral STEMI. The leads that struck me as the most bizarre were I/aVL and V3/V4. It also appears a bit slow for VT. Regardless, a wide and bizarre post-arrest rhythm would probably have me thinking high-K before AMI. Good case to remind me to consider all H's and T's. The rate is 130, which is only slightly slow for VT. Yes, of course K is always a consideration. It was 3.1. pH was 7.07. Why are we worried about a STEMI? This Pt has a anterior hemi block (as seen in the axis deviation I = up II = down III = down) and a RBBB. These two blocks together make a bifascicular block.. This is a major indicator for a complete heart block. Any time the Pt has a bifascicular block the STEMI is the least of the Pt problems. As lectured at Bob Page's "Multi Lead Medic" seminar. The reason the patieent has block is that he has ischemia of the conducting system. By far his greatest danger is losing myocardium. If you get the artery open, you restore the conduction. Get him to the cath lab! Lead I is actually biphasic. The terminal S caused by the RBBB in lead I is masked by the massive ST elevation. Lead I will not be purely upright in a RBBB even with a LAFB because you will always have a late rightward depolarization. As for biphasicular blocks being "more important" than the STEMI, make sure you take Multi Lead "MEDIC" in context. He is teaching what you as a medic should look for and do, but not necessarily what the patient ultimately needs. You can very effectively manage a heart block in an ambulance with transcutaneous pacing and drugs. The STEMI needs PCI in a cath lab. So for a medic, absolutely manage the complete heart block if it occurs and get him to a cath lab ASAP. But the STEMI is the ultimate (and MUCH bigger) problem. A biphasicular block is a warning sign of the POTENTIAL for a problem (a 3rd degree block). A STEMI is a real problem. Thank you. The upright lead I is due, as the previous posteer accurately pointed out, to the coexistent Left anterior fascicular block. You are correct that the patient is at some riskk of complete heart block, but is not in block now. In fact, the PR interval is short which makes any imminent progression to complete block very unlikely. 1) Pathological LAD is no help in calling VT. ERAD would be better. 2) Although you say the patient has a rsR' type morphology in V1. the r wave is so small, it's almost nonexistent. Therefore, the morphology of V1 is positive in a, not so great, "Firemans Hat" appearance. 3) The ventricular depolarization transitional zone is @ V4, which is normal......no help. 4) V6 is negative. This is the #1 detail that would cause me to believe this is Ventricular in origin. Since there a P waves, this can't be VT. If the impulse originates in the SA node and the impulse is traveling to the ventricles using the normal patways (with the exception of the RBBB), how is V6 negative? The positive pole of V6 is at the base of the LV....it should be positive....even in a RBBB. 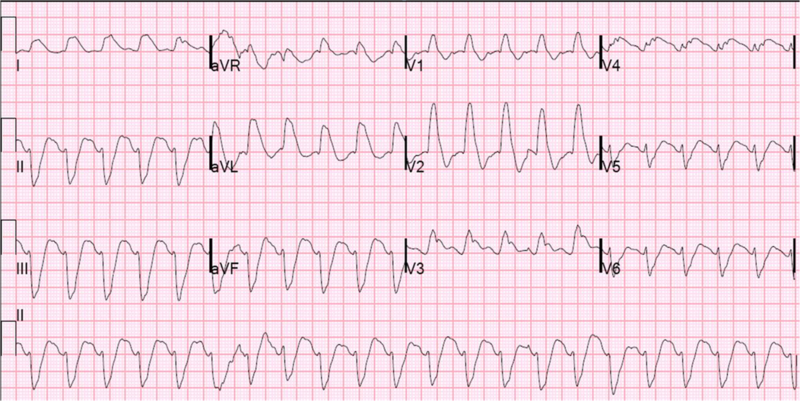 Could these "P-waves" actually be U-waves, therefore it is VT? And then under those someone could go through the criteria for each to help distinguish between MI. Also i still cant figure out where fasicular blocks and right bundle branch and fasicular + right bundle branch block come into the picture! The problem with The fasicular blocks and the right bundle is really annoying because those are the ekgs i have the most problems with. I was diagnosed with rbbb& Lab on my ECG report is this Consisdered a type 2 mobitz heart block? Since these originate are in his bundle area. Maybe I said it wrong above it appears I put lab>I meant my report stated Rbbb with a LAFB this makes a dfference ? Right is this a serious conduction problem ? Any new bifascicular block (1. LBBB (LPFB + LAFB) 2. RBBB + LAFB 3. RBBB + LPFB) in the setting of MI, especially with lengthening PR interval, can lead to complete heart block. So one must be vigilant. I ask my cardio a question about my Rbbb & Lafb he told me that this meant that the electrical flow was just passing thru the left bundle but the problem is I never had a Lafb Finding combination on my report And also with just a rbbb wouldn't it be conducting thru the Left side anyways. So this finding Is Separate from just a Rbbb Right ? Aren't they 2- Separate findings ? and if So why is he acting as though its still Just a Rbbb. And not a Bifascicular Conduction problem .they haven't said their was a MI involved or blocked atery So I still be Concerned? The impulse travels fast only down the posterior fascicle, then slowly to the area that would normallly be depolarized by the anterior fascicle and the right bundle. So LAFB is only a partial LBBB. Also forgot too ask a important question if a ECG Shows a Rbbb & Lafb.will it show up every time on a ECg because he told me he didn't see it on the New ECG test Or do ECG change conitiously ? Thanks. What about post arrest ECGs? I have seen quite a few patients with nasty looking ECGs, broad complexes, ST changes early after ROSC (especially prolonged arrests) that then resolve on repeat traces. In this case even if I thought it was VT (which I may well in the heat of the moment) I would be very suspicious of STs V3-4, I, aVL. Also a 51M post arrest is probably going to the lab anyway, especially if CP first. If you're not sending him to the cath lab anyway, and you think these are just post arrest changes, then wait 10 minutes and get another. However, with RBBB and LAFB, these are unlikely to be post arrest and much more likely to be Left Main or proximal LAD. Are you sure this isn't VT? AVR and V6 look like VT. You didn't respond to Nick Adams. The p waves could be retrograde. It is slow for VT if he was having an acute MI. Do you know what happened with this patient? Definitely sinus. P-waves are present and have the exact correct morphology for P-waves. This is a classic EKG of a sick patient with proximal LAD occlusion, RBBB, LAFB, and pseudo VT. I have seen it many times. Memorize this morphology. How about calling it IVCD?? as there is no S wave in lead 1 and from what i have read a classical RBBB has has wave in lead 1. or is it because STe in 1 causes the loss of s wave??.. Any comments??? No. It is RBBB. 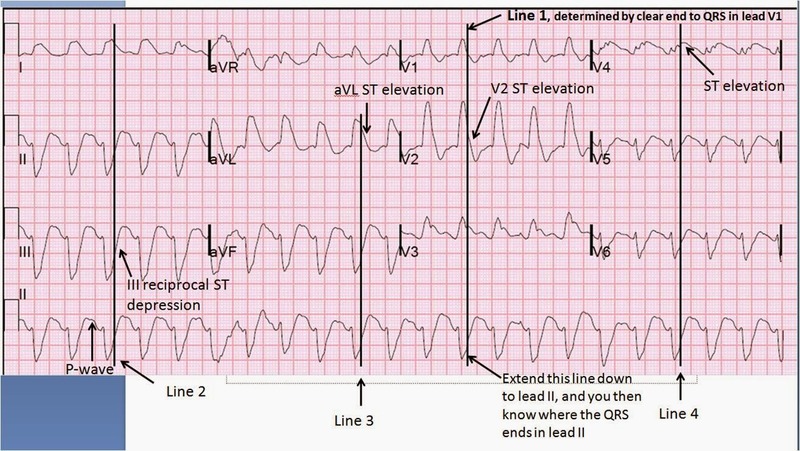 There is no S-wave in I because of terminal QRS distortion from the ST elevation. Mr Smith thank u so much. I'm a little mystified about what makes the end of the QRS "easy" to find in V1? As this is the key step in being able to assess the ST segment, I'd love to known any tips for confidently identifying the end of the complex.